Federal law enforcement officials reported concern Friday over vague threats of an al-Qaida terrorist attack that could come today in an attempt to disrupt Tuesday's U.S. elections. Three states – New York, Virginia, and Texas – were identified as potential targets. So it makes sense that FBI agents in eight states reportedly wore out some shoe leather during the weekend, knocking on doors of people with family connections to Afghanistan or Pakistan – both operating bases for al-Qaida. One of those questioned reportedly is a youth group leader. Others were doctors. To the Council on American-Islamic Relations (CAIR), this is an "outrageous and ... borderline unconstitutional" "sweep" of American Muslim leaders. The Dallas Morning News, Washington Post and Time magazine all published stories on the FBI action, offering little in the way of push-back to CAIR's narrative. The FBI is "harassing" Muslims in Oklahoma, CAIR's state director Adam Soltani wrote on Facebook, Time reported. 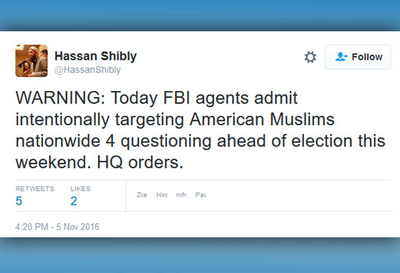 CAIR-Florida director Hassan Shibly heard from six people contacted by the FBI, the Post story said. CAIR's Texas office heard from 17 people. The stories lamenting this alleged FBI outrage, therefore, offered two dozen examples nationally. CAIR officials sounded the alarm on social media, urging Muslims not to say anything to the FBI without a lawyer present. The organization offered to provide counsel to those who needed it. CAIR's campaign then attracted the media coverage. Calling it a "sweep," as Shibly did, usually connotes mass arrests, not knocks on people's doors. The Post at least placed the word in quotes. This raises a question: What is the FBI supposed to do when it learns terror plots may be in the works? The news stories don't say. They do quote CAIR officials expressing their outrage. "The FBI actions ... to conduct a sweep of American Muslim leaders the weekend before the election is completely outrageous and ... borderline unconstitutional," Shibly told the Post. "That's the equivalent of the FBI visiting churchgoing Christians because someone overseas was threatening to blow up an abortion clinic. It's that preposterous and outrageous." No, it's not at all like that. There is no foreign terrorist network advocating American abortion foes to attack clinics. ISIS and al-Qaida have spent years advocating random, homegrown terror attacks in online videos, social media and in glossy publications. It's a disturbingly effective message, proven successful by the number of people who have tried to leave the country to join ISIS, or who have been arrested trying to do so, or who have plotted to carry out attacks. Horrible attacks in just the past year show that individual actors responding to the call to jihad can create huge casualty counts. Omar Mateen killed 49 people at Orlando's Pulse nightclub, pausing in his slaughter to call 911 and pledge allegiance to ISIS leader Abu Bakr al-Baghdadi. Syed Rizwan Farook and his wife Tashfeen Malik killed 14 people at an office Christmas party in San Bernardino last December. And in September, 29 people were injured when a homemade bomb went off in a Manhattan dumpster. A second bomb was found nearby. Investigators later found five additional unexploded bombs in a trash can in Elizabeth, N.J. near a transit station. CAIR officials insist they are not trying to hinder the FBI. They say they merely are ensuring people know about, and use, their constitutional right to have counsel present for any questioning. But CAIR's long record of sowing fear against the FBI casts doubt on that assertion. Its "Know Your Rights" lectures have long included claims of tales of FBI agents breaking the law and willing to do anything in order to snare innocent Muslims. 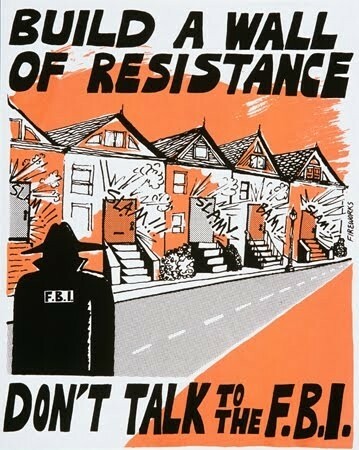 FBI agents are depicted as sinister forces lurking outside Muslim homes in images carrying the message "Build a Wall of Resistance: Don't Talk to the FBI." Indictments of terror suspects involving informants and undercover agents are always dismissed by the group as entrapment, though no jury or court has agreed. 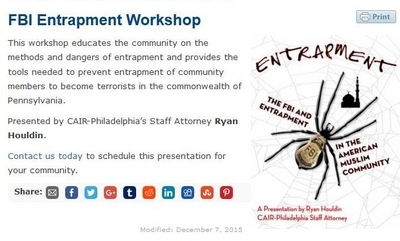 A December promotional page touting an "entrapment workshop" depicting the FBI as a spider out to snare the Muslim community in its web remains active on CAIR's Philadelphia office website. Last year, when authorities in Boston overheard a terror suspect they had been monitoring say he was going to go out and start stabbing police officers, CAIR spent days casting Usaama Rahim's subsequent death as unjust despite video showing Rahim lunged at officers ordering him to drop a military grade knife. No one would have learned that fact from reading any of the stories parroting CAIR's outrage, unless he or she conducted independent web searches. Likewise, readers would not know that the FBI broke off outreach communication with CAIR in 2008, after an investigation placed the organization and its founders in the middle of a Muslim Brotherhood-created Hamas support network in America. "[U]ntil we can resolve whether there continues to be a connection between CAIR or its executives and HAMAS, the FBI does not view CAIR as an appropriate liaison partner," an FBI official explained in 2009. The policy remains in effect 7½ years later. Once upon a time, the Morning News had CAIR's number, investigating and exposing radical Islamist activity supporting Hamas in north Texas during the 1990s. The Post has never devoted a story to the evidence that led to the policy. The FBI declined to comment, the two newspapers reported. But missing from the stories were perspectives from retired law enforcement officials, at the very least, and an explanation about how the Bureau works in situations like this. This context would have been a service to readers, offering balance to CAIR's talking points. People in eight states are being targeted for questioning, the Post reported. "Several of the states — including Florida and Pennsylvania — are viewed as crucial swing states heading into the presidential election Tuesday," the story said, underscoring Shibly's claim that this is some kind of pre-election intimidation campaign. But other states, especially Texas, Oklahoma and Kansas, are not considered competitive Tuesday. No CAIR official presented anything to support the organization's allegation that voter intimidation is in play. Yet, the Post and a story on Fusion.net included it. Fusion's story argued that the FBI is somehow ignoring threats of violence from white nationalists and militias, a claim belied by recent arrests. If the FBI started arresting Muslim Americans without cause, CAIR's campaign of fear and hysteria might make sense. But pursuing information about a possible terrorist attack, in swing states and decidedly red states, is not sinister.